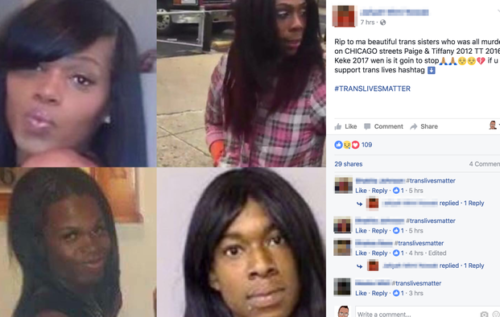 A 24-year-old transgender woman was found shot to death in Chicago early Wednesday morning. Keke Collier, who was originally misgendered by police and local media, was found with gunshot wounds in her chest, arm, and hand, police said. She was taken to a hospital and later died. Police said the suspect had dreadlocks and a black hoodie and fled in a red car. Police do not know anything else about the circumstances of the shooting. Shasha Lauren, one of Collier’s friends and a peer navigator at Chicago House, told Mic that she had spoken with witnesses who said that Collier got in a car with the man who later shot her. Another friend of Collier’s, Jaliyah Armstrong, posted video to Facebook from a vigil late Wednesday night.